When Jacklyne Pham’s parent’s moved to America from Vietnam in 1981, they were pregnant with Jacklyne and hoping to give their daughter a great life in America while still hanging on to their beloved Vietnamese culture. After the war, they first ended up in Honk Kong and then moved on Massachusetts, where Jacklyne’s uncle lived. With Massachusetts came opportunity, family, and, begrudgingly, lots of snow. So, Jacklyne and her parents moved once again to Southern California, where another piece of their family resided. Today, Jacklyne still lives in Southern California, now with her husband and five-year-old son, and continues to keep the Vietnamese culture alive. Part of the ideals that her parents instilled in Jacklyne were hard work and education. In 2007, Jacklyne enrolled at a state college in California, intending to go the biology or pre-pharmacy route, hoping to one day work in a medical setting. The parking and commuting woes weren’t Jacklyne’s only complaint about traditional, brick-and-mortar schooling. That’s when Jacklyne found Columbia Southern University and her “life changed completely.” She decided that LifePace Learning was a good option for her and she was able to take courses she enjoyed and in which she excelled. She graduated in 2011 with her Bachelors of Science degree in Occupational Safety and Health and then again in 2016 with her Masters of Business Administration with a concentration in health care administration. Jacklyne has become known as the Referral Queen; she tells people about CSU everywhere she goes and has personally referred eight of her friends who have become CSU Knights, a few of whom have or are close to graduating. She also quickly found CSU’s social media channels for students and alumni to interact with one another, including the Facebook student closed group. Jacklyne says she travels to Vietnam at least once a year and is very connected to her family and the culture there. She was recently there for her grandmother’s funeral and says she visits as often as she can. She strives to stay sharp in the language and while she can’t write in Vietnamese very well, says she can get by when she is there. She says raising her son, Logan, in California, makes her grateful for the Vietnamese influence there and strives to immerse her son whenever she can. Jacklyne says she talks to her son in Vietnamese and believes being bilingual will be beneficial to him as he grows up. She keeps the traditions alive, especially in things like memorials, ancestory, and special dates and holidays. Jacklyne says she and her family get together for a truly traditional and festive Lunar New Year. They celebrate with a feast, give thanks to their ancestors for the blessings of the previous year and light incense candles and stay up late to greet the New Year. They ask their ancestors to protect them and give a successful, prosperous year ahead. Another favorite Lunar New Year tradition is the red envelope. This cultural practice has been alive for generations and symbolizes luck and wealth. An older family member gives a sealed red envelope, filled with lucky money, to the younger family members. They exchange greetings of good advice and wisdom. This Lunar New Year, Jacklyne celebrated with her husband and son in traditional Vietnamese clothing and rituals, but also included a trip to Disneyland. Passing to her son the same traditions and culture that her parents passed to her is very important to Jacklyne. She plans to enroll her son in the only English/Vietnamese dual immersion school in California when he starts kindergarten next year. Jacklyne says that most things she does are fueled by her desire to give her son the best life possible. She began studying for her master’s degree when she was pregnant with him and when she was eight months pregnant, tragedy struck their family. Her brother-in-law was diagnosed with acute lymphoid leukemia and after a one-year battle, he died just a month before Jacklyne would give birth to his nephew. Jacklyne realized she didn’t do well with blood and that a degree in Occupational Safety and Health would be a good route for her. As life so often happens though, things didn’t work out exactly as she planned. Jacklyne had her son and she and her husband started a business together, an IT company that hosts third party emails, survey lists, networking backups, and data recovery. This allows her to stay home with son, travel, but still have a hand in the medical field. 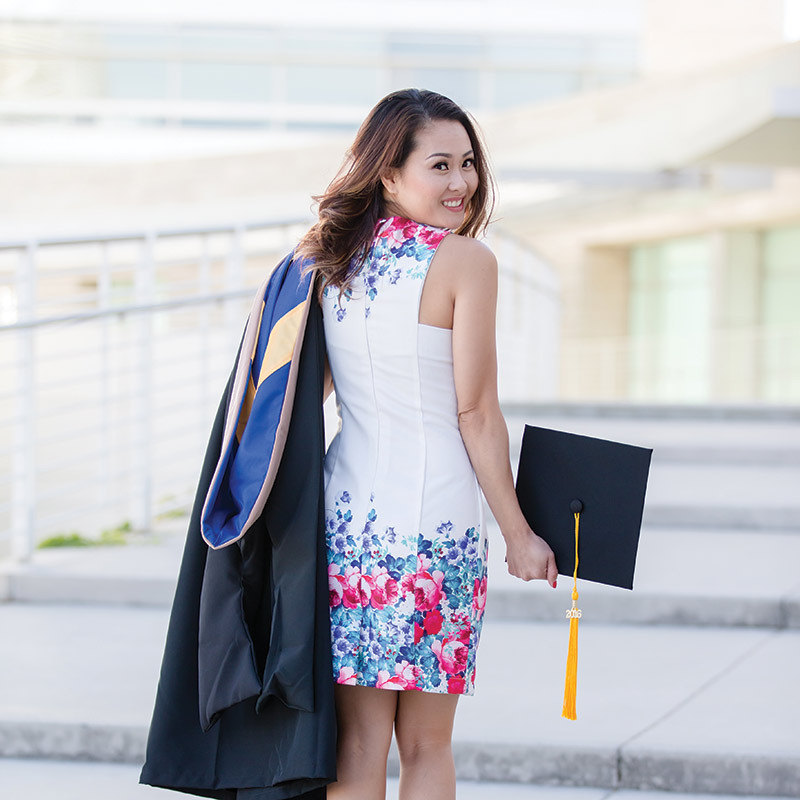 Since she graduated, she has been taking time to destress and travel the world. She has been to Vietnam twice, Belize, and is set to visit Japan, Korea, Florence, and Rome. When she settles back into life at home in Southern California, she plans to start working toward her doctorate degree. Eventually, she thinks she would like to teach. Jacklyne has experienced a lot and does not plan on stopping anytime soon. Throughout every experience, hardship, trip, and tradition, she hopes to stay true to her roots and bring honor to her family heritage.